In a 2-player game, place 5 Factory displays. In a 3-player game, place 7 Factory displays. In a 4-player game, place 9 Factory displays. Return any unused Factory displays to the box. Note: If you have difficulties telling the colors of the pane pieces apart, see page 6 for an alternative setup of the Factory displays. Place the glass tower B beside the Factory displays within reach of all players. 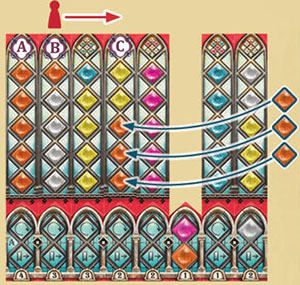 Then each player receives the 8 double-sided pattern strips of his color, shuffles them, and places one at random above each of the 8 spires of his palace board D. For most strips it does not matter which side is facing up. However, each player has one strip with 2 gray joker spaces on one side. Players who placed that side up must flip that strip over, so that the joker spaces face downwards. Each player takes the glazier E of his color and places it above his leftmost pattern strip. The player who most recently cleaned a window receives the starting player tile and places it next to his palace board. Determine who will be in charge of the scoring board F. This player places the scoring board next to his palace board, puts one marker of each player's color onto space 0 of the score track G and one marker of each player's color onto the top space of the broken glass track H.
Next, he takes 1 pane piece of each of the 5 colors ( ), closes his hands around them and shakes them. Then he drops them - one at a time - at random onto the table, placing them in the order they fall onto spaces II to VI of the round indicator I. Finally, he fills the bag with the remaining 95 pane pieces J, draws another one at random and places it onto space I of the round indicator K.
Then the player with the starting player tile fills each Factory display with 4 pane pieces randomly drawn from the bag L and then places the bag nearby. To be the player with the most points at the end of the game. The game ends after 6 rounds and a final scoring phase. 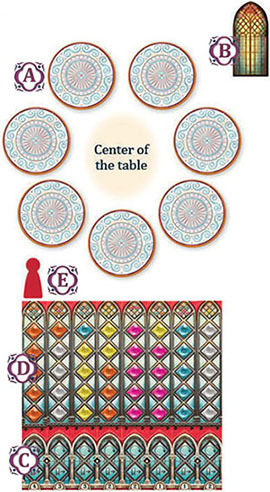 The game is played over 6 rounds..
Each round begins as follows: First, the player with the starting player tile places it in the center of the table. Then he takes the first turn of the round. Afterwards, play proceeds clockwise with the players taking turns until all pane pieces from the Factory displays and from the center of the table are gone. Pick all pane pieces of one color from any one Factory display and then move any remaining pane pieces from this Factory display to the center of the table. Example: Amanda picks the pink pane piece from a Factory display and moves the other 3 pieces (that are not pink) to the center of the table. Pick all pane pieces of one color from the center of the table. 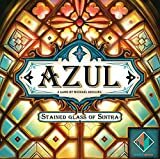 Attention: If you are the first player in this round to pick pane pieces from the center of the table, also take the starting player tile from the center, place it next to your palace board and have the player who is in charge of the scoring board move your marker on the broken glass track 1 space down. Example: Amanda decides to pick the 3 orange pane pieces from the center of the table A. Since she is the first to pick from the center this round, she also takes the starting player tile B and places it next to her player board. Because of this, her marker on the broken glass track moves down 1 space C.
The pieces you picked must be placed onto spaces of the same pattern strip (this means that you cannot allot them across different strips). This pattern strip can be either the one directly beneath your glazier or any one of those to his right (never those to his left). If you choose to place the pieces onto a strip to the right of your glazier, first move him to that strip (placing him directly above it). If you do not have enough empty matching spaces on the chosen strip, any excess pieces are considered to have fallen to the floor and broken. For each of these "broken pieces", your marker on the broken glass track moves one space down. Then drop these "broken pieces" into the glass tower. If you have no matching space for any of the pieces you picked, all of them are considered "broken pieces". However, as long as you have a strip with at least one empty matching space that your glazier can reach, you must place the pieces on that strip - even if you would prefer to drop them all on the floor. Attention: Each player has one strip that shows 2 gray joker spaces, each of which can hold a pane piece of any color. Example: After picking the 3 orange pieces from the center of the table, Amanda must place them onto one of her pattern strips. She cannot place them onto strip A because it is left of her glazier. She could, however, place one of them onto the empty orange pattern space of the strip beneath her glazier B and let the other 2 pieces "fall to the floor and break" (for which her marker on the broken glass track would move down 2 spaces). 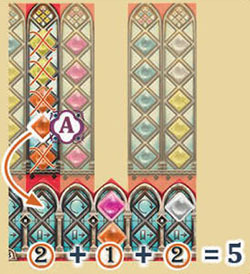 Or she could place all 3 orange pieces onto the 3 empty pattern spaces on strip C if she moved her glazier to that strip. If, after you are finished with step 2, one or more pattern spaces of the strip beneath your glazier are still empty, your turn is over and it is the next player's turn. First, check if you get any color bonus points: count how many pieces on your completed strip match the top piece of the round indicator and gain that many points on the score track with your marker. If none of the pieces match, you gain no color bonus points. Note: At the end of each round, the top piece of the round indicator is removed. This way, you can always keep track of which round you are on. Example: Amanda has completed her pattern strip A. She checks the round indicator to see if she gets any color bonus points: It is round 3 and the top piece on the round indicator is a yellow piece B. Since her completed strip has 2yellow pane pieces, she immediately gains 2 points on the score track. If that palace window is still empty, put the pane piece onto that window's top frame space and then flip the strip above the window to its other side. Leave your glazier above it. If the top frame space already has a pane piece, put the new pane piece onto the bottom frame space of that window. Since the window is now complete, remove the strip above it from its slot and return it to the box. Leave your glazier above that empty slot. Finally - whether the palace window that you just furnished holds one or two pane pieces - score that window now: gain the points printed below that window and, in addition, all the points printed below those windows to its right that contain one or two pane pieces themselves. Then your turn is over. Note: If you are playing with side A of the palace boards, it doesn't matter which of the pane pieces you move to your palace windows. If you are playing with side B, however, it can be important in regard to the final scoring (see section End of the game for details). Example (continued): Amanda removes all pieces from the completed strip by dropping 4 of them into the glass tower and moving one A to the top frame space of the window beneath the strip. Then she flips that strip to its other side. Afterwards, she scores 5 points (the 2 points printed beneath the window itself + the points printed beneath those windows to its \^right that hold at least one pane piece). Instead of picking any pieces, you can move your glazier back to above your leftmost pattern strip. (Note that you can't move him above an empty slot!) Then your turn is over. Important: If your glazier is already above your leftmost strip, you can't choose this action and must pick pane pieces instead. If, at the end of any player's turn, there are no pane pieces left on any Factory displays AND in the center of the table, the round ends. 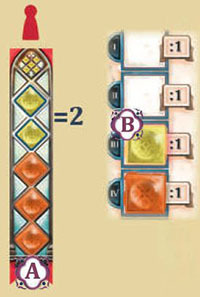 The player with the starting player tile refills each of the Factory displays with 4 pane pieces from the bag as in the setup. If the bag is empty, refill it with all the pieces from the glass tower and continue filling the remaining Factory displays. Then, start the new round. In the rare case that you run out of pane pieces with none left in the glass tower, start the new round as usual even though not all Factory displays are properly filled. After the sixth round, the game ends. Then the final scoring phase occurs. On the score track, gain 1 point for every 3 pane pieces left on your pattern strips. Lose the points shown to the right of your marker on the broken glass track. Attention: If, during the game, any marker on the broken glass track reaches the bottom space (-18), its owner loses 18 points immediately and the marker is returned to the top space. If all 4 frame spaces hold a pane piece, you gain 10 points. If any 3 of them hold a pane piece, you gain 6 points. If any 2 of them hold a pane piece, you gain 3 points. If one or none holds a pane piece, you gain 0 points. Count how many completed windows you have on your palace board. (A window is considered complete if both of its frame spaces hold a pane piece). 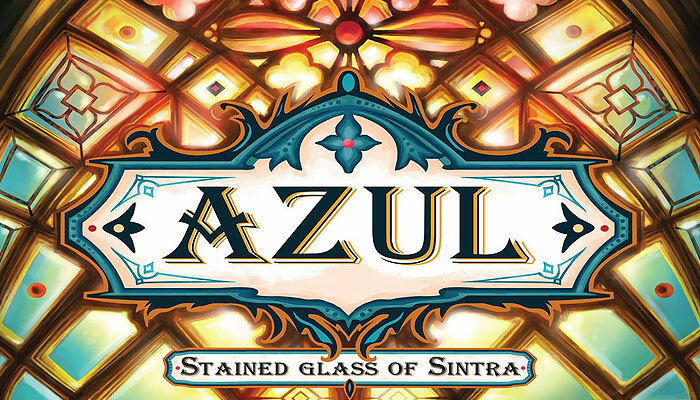 Then choose one color and count how many pane pieces of that color you have placed on the windows of your palace board. Multiply this number by your number of completed windows and gain the result as points on the score track. The player with the most points wins the game. In the case of a tie, the tied player who has lost fewer points via the broken glass track wins. If this does not break the tie, the victory is shared. During step 1 of the setup: Flip the Factory displays to their back. Each of them shows 5 sectors: one for each type of pane piece, made recognizable by their color and the different shapes engraved in them. On 5 of the Factory displays, one sector is more colored than the others. Make sure that you include these 5 Factory displays when creating the circle and arrange them so that each fully colored sector points towards the center. During step 8 of the setup and each time you replenish the Factory tiles at the end of a round: Arrange the 4 pieces on each Factory display so that each lies in its matching sector. 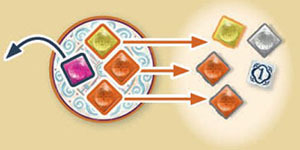 During the game: When you move pane pieces from a Factory display to the center of the table, always place each piece near its matching fully colored sector. To show which color the current top pane piece of the round indicator is: Use any kind of marker (for example a coin) and place it near the fully colored sector that matches the current top pane piece of the round indicator. When placing pane pieces on your strips: Pay attention to the shapes shown on the pattern spaces and match them with the appropriate pieces.